More and more couples are foregoing the expensive lavish 14 tier mega cakes with fondant roses for a simple cake just on display for the cake cutting purposes. Instead of the large multi tiered cake, they are choosing to spoil their guests with dessert tables filled with childhood favorite sweet treats or family made pies or trendy doughnut bars. 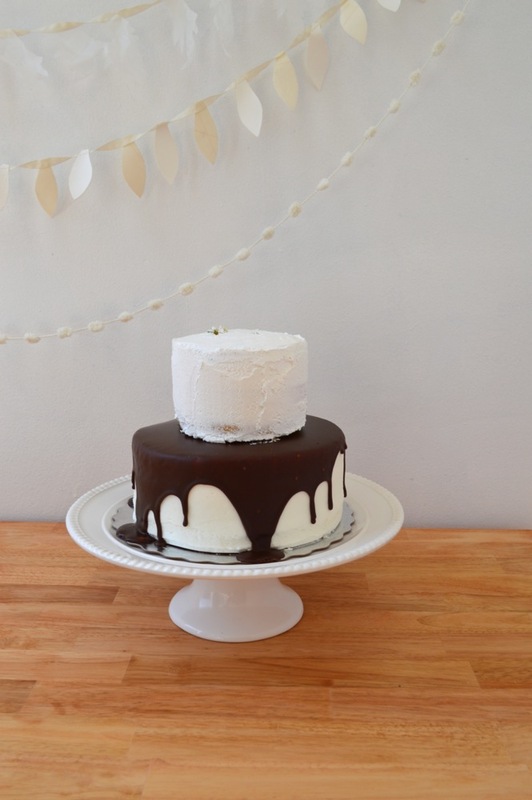 In today's post I'm going to show you some easy and inexpensive ways to DIY your own little wedding cake! I've put together three different cakes with three different easy toppers that you can put together or find in less than 30 minutes! So, if cake just isn't your thing read on (if it is your thing then by all means make a stunning professional cake your priority!) and see how you can have just a little one to appease tradition and then take the money that you save by DIYing your cake and use it for a really awesome photographer or renting a food truck for late night dance snacks instead! Completed cake with vintage salt and pepper shakers as topper. Two store bought cakes get a makeover. Take a small spatula and gently scrap excess frosting off of each cake. Smooth out remaining frosting.Then with a large spatula place the smaller cake on top of the larger one. Place your vintage salt and pepper shakers on top. Next adorn the cake with fresh flowers to cover any "messy" frosting. This cake is easy to assemble and can be done the morning of the wedding or night before. Purchase two cakes (The ones I used were grocery store cakes and were an 8 inch cake for $13.99 and 4 inch cake for $5.99) from your favorite bakery or local store. Try to find ones that don't have too much embellishment or decorative frosting. Next, scrape off any excess frosting from each cake. I removed the blue frosting from this 4 inch cake and a dollop of frosting and sprinkles from the 8 inch. Gently place the smaller cake using a spatula on top of the larger one making sure to center it. Then decorate with your choice of cake topper and fresh flowers. I chose a vintage set of salt and pepper shakers for the cake topper. They can be used again after the wedding on your dining table! Tips: I suggest practicing a few weeks before your big day to see how you want it to look. It won't hurt to make a mistake on your practice cake and then when you get it how you like snap some photos to refer to when you go to create your wedding cake. After you assemble your cake keep it in the fridge until you need it out on the dessert table. A homemade cake with fluffy frosting and fresh mango between the layers. Topped with a family photograph, fresh flowers, and figs. To make the cake topper you'll need a copy of a old photograph, cardstock, glue, a wood skewers, and scissors. Carefully cut around your copy of the vintage photograph. Draw a bead of glue along the wood skewer and press on the back of the photograph. Glue down a strip of cardstock on top to sandwich the skewer in between. 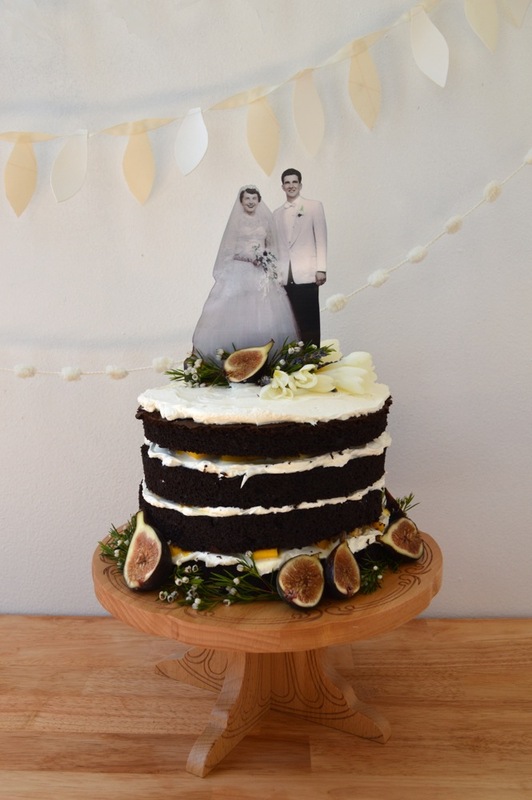 Position cake topper and then adorn the top and bottom of cake with fresh flowers and sliced figs. Want to honor your family on your wedding day? This cake is a perfect way to! Either you or a family member can bake the cake layers and then you can assemble the cake the night before or day of. Make it extra special and use an old family recipe or ask your Aunt Judy who loves to bake to showcase her skills. I baked off two 8 inch cakes then used a cake leveler (a cheap and wonderful thing to have if you bake) to cut each cake in half after they had cooled. I brushed the top of each layer with orange liquor and then frosted the top. Start with the bottom layer then repeat adding each layer on top the next then brushing liquor and frosting as you go. I added chopped ripe fresh mango between the layers but you can use any fruit and cake flavors you like! For the cake topper, make a color photocopy of a vintage photograph (I used a photo of my grandparents on their wedding day and sized it down to a 5x7 copy to fit the size of the cake). Carefully cut around the figures in the photocopy then glue a wood skewer and sandwich it with some cardstock for stability on the back. Place in the center of cake and adorn the top and bottom with fresh flowers and fruit! Tips: Make your layers a few days in advance and brush them with the orange liquor or a fruit preserve. The cake will soak it up and stay moist! 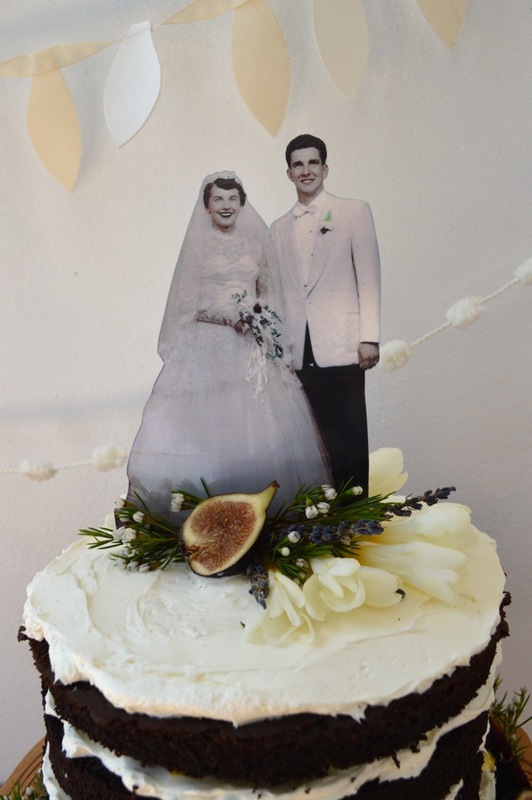 You can honor many family members by making a dessert table using these vintage photo cake toppers on each of the desserts instead of just one cake. 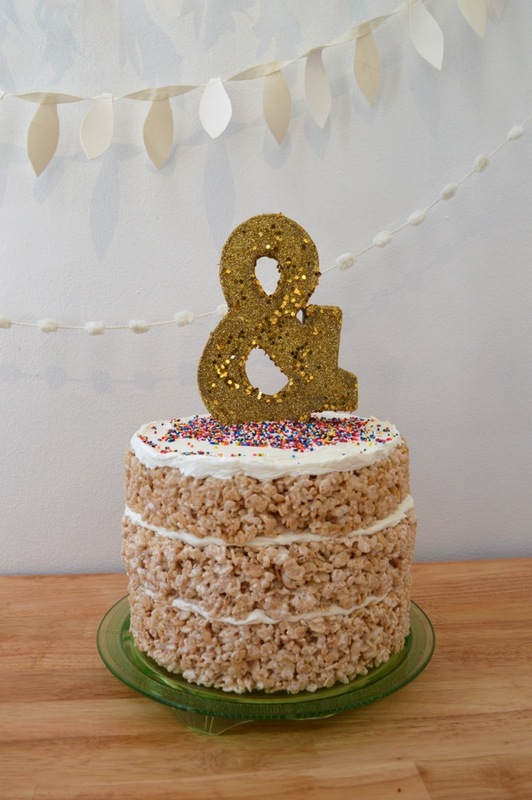 A naked cake made from layers of rice krispie treats, vanilla frosting, colorful sprinkles, and a glittery gold ampersand topper. For the topper you will need a cardboard ampersand, glue, a brush, and a variety of non-toxic gold glitter. Paint each side of the cardboard ampersand with glue then shake on glitter, repeating for each side (except the bottom where it will rest on the cake). Assemble layers of rice krispie treats with frosting in between each. Cover the top of the cake with another layer of frosting, rainbow sprinkles, and then place the finished dry ampersand on top. Maybe you don't want any cake at your wedding at all and you would rather serve a guilty pleasure you and your partner share? You can make it into a "cake"! You can pile brownies or oreos or doughnuts in a cake shape then place your topper on top! Here I've made a naked three layer "cake" out of rice krispie treats. I simply made them as per the box instructions, but then pushed them into a greased spring form pan. Press down the krispies with the back of a greased spatula into the pan really well. Wait until each layer cools then just unlock the spring form and remove your finely shaped layers. Frost between the layers with your favorite frosting and then top with sprinkles and a glittery ampersand for a bold and bright dessert. Tips: To keep your glitter from shedding spray the ampersand with some acrylic clear gloss to seal it and let it dry sufficiently before placing on top of your cake.